As the lone youth representative in Congress, I am delighted to share the news that the House and the Senate have approved an P8.3-billion appropriation for free tuition in all state universities and colleges (SUCs) and additional funds for incentives and grants in 2017. This is a victory for the youth movement which has long fought for the right to education. This is great news for the nation's youth and their families, especially the poor and marginalized. Perhaps, this is the best news for millennials this year, and one which will have a profound and long-lasting effect on their futures and especially our nation's. We call on students, youth and the general public to solidly follow through on this initial victory --- we must actively shape and monitor the swift and fair implementation of this historic furtherance of tuition-free policy in SUCs. 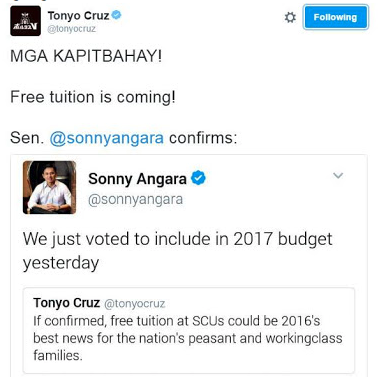 The 8.3 billion special appropriation in Higher Education Support Fund (HESF) is a gamechanger and a step in the right direction for SUCs, albeit the 2017 budget remains to be pro-big business and corruption-prone, framed to implement and further exacerbate neoliberal attacks against the Filipino people. Thus, we must continue to oppose neoliberal policies of deregulation, privatization and denationalization of education. We must collectively advance our struggle to reclaim the public character of SUCs and institutionalize free public education in all levels. Together, let us fight for our right to education! This only means that all students studying at universities and colleges listed below (I only listed the Region 10 SCUs here) will no longer have to pay for any tuition fee. Yes, Filipinos can now get their degree at no-cost at all!